Okay, this isn't the most popular stop on Rams memory lane but I'm intrigued by Rams photos of all eras and Tony Banks and the gang aren't going to be getting any reviews any time soon. I just hate to think that any photos will be lost to Rams fans. The negatives are for sale over on ebay right now by the way. Not mine, I just watch for new ones. Might be able to peddle your Hakim TD catch. The other photos probably a tough sell. 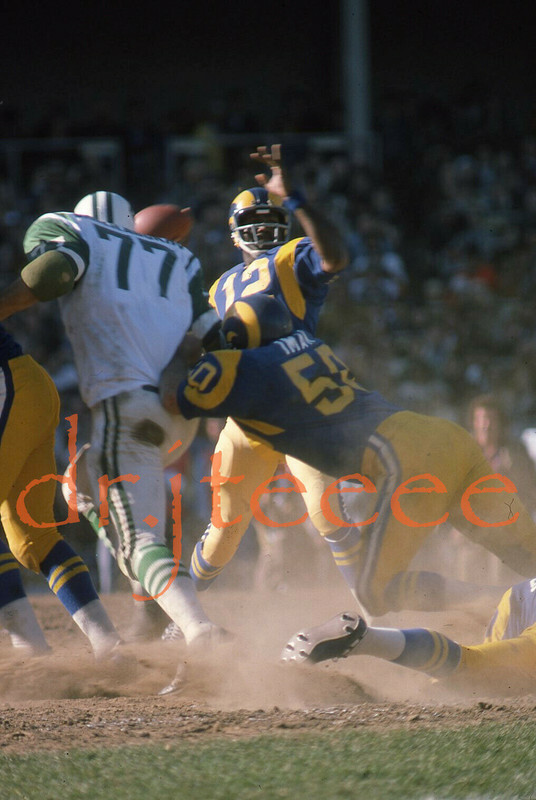 Rams1PlateSince1976 wrote: Might be able to peddle your Hakim TD catch. The other photos probably a tough sell. These aren't mine. The lot is being sold by what looks to be a Chicago based photographer. Pretty cool. I ought to go through some of mine to see if I can make some money. This is from 1983 (35mm not digital). The only problem is, this actual picture is crystal clear and focused but scanning it into the PC changes things. Here's a digital if anybody wants to buy it!!! It's from another unpopular forgettable time (2007) with Gus Frerotte at QB. The target is Brian Leonard. I really like that SBXIV shot. A closeup of that shot of Vince would make for a good 8 x 10. And I actually appreciate the shot of Frerotte too. I don't know what it is. The Rams have been so bad for so long, it's almost a sort of comfort zone. Not that I enjoy all that losing but it's a Stockholm Syndrome or something. They were bad but they were ours and it was us against the world for whoever was actually there. moklerman wrote: I don't know what it is. The Rams have been so bad for so long, it's almost a sort of comfort zone. Not that I enjoy all that losing but it's a Stockholm Syndrome or something. They were bad but they were ours and it was us against the world for whoever was actually there. I have some shots (if I can find them) of opening day, 2008 in Philly. We got beat 38-3. Amassed on that Sunday by the mighty Rams was 166 yards of offense. I say "if I can find them" because I don't remember but I might have lost the memory card. There's a pretty good chance I just threw it away. Stockholm Syndrome? After watching the Rams from 2005-2016, I had Dresden Syndrome. PARAM wrote: I have some shots (if I can find them) of opening day, 2008 in Philly. We got beat 38-3. Amassed on that Sunday by the mighty Rams was 166 yards of offense. I say "if I can find them" because I don't remember but I might have lost the memory card. There's a pretty good chance I just threw it away. Stockholm Syndrome? After watching the Rams from 2005-2016, I had Dresden Syndrome. ha ha, yeah, that was an ugly opening day performance, in fact it was the worst opening day loss (point differential) in rams history.